HubSpot invited social media power influencer, Lilach Bullock to tell her story of how she grew her Twitter following from 0 to over 82,000 engaged brand evangelists. Not only that, but Brian Lavery of Twitter joined to reveal his secret to growing and engaging your followers. Content Powered by HubSpot. 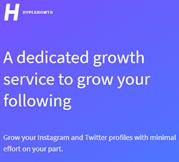 How Buy Twitter followers and Instagram followers?